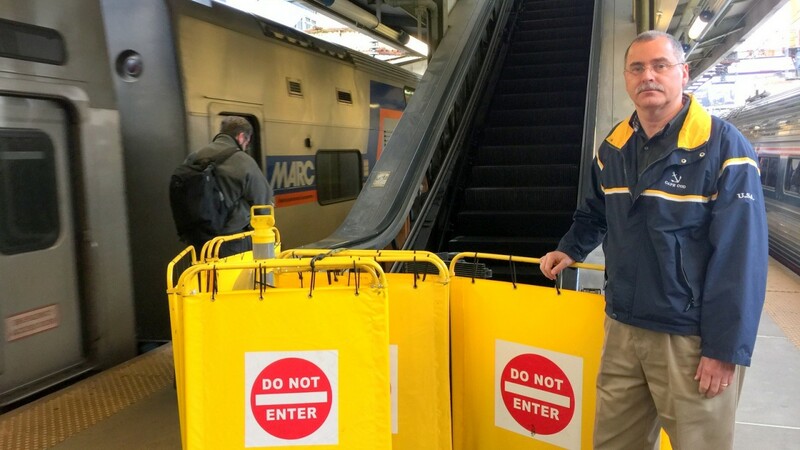 Since the middle of March, the escalator serving MARC passengers at Baltimore’s Penn Station has been out-of-commission. That dysfunctional escalator irritated regular MARC commuter, Bill Robertson. Exiting passengers have had to wait in long slow lines stretching nearly the length of the platform. A staircase and a small elevator are the only other way to get up to the station lobby. Why, Robertson wondered as the weeks stretched on, weren’t they fixing the escalator and eliminating this inconvenient and potentially dangerous bottleneck? After multiple phone calls and emails and intervention by two state lawmakers, Robertson remains frustrated and the escalator as of today is still not working. “Commuters at Penn Station are forced to deal with safety hazards as Amtrak drags its feet,” Robertson complained in an interview with The Brew. His quest for answers expanded to other problems he noticed at the century-old station. One of the three platforms remains unused, he noted. The offices upstairs are still empty and neglected, with many broken windows visible from outside the station. And a rusted-out, leaking canopy outside the west entrance facing Charles Street makes waiting for the bus there a miserable experience in bad weather. “You won’t find a dry spot anywhere” after it rains, said Robertson, a longtime daily commuter to Union Station in Washington. Robertson initially raised complaints in mid-March with Amtrak’s district manager for Union Station and Penn Station, Miriam Morgan, but his email and voicemail messages got no response. Amtrak customer service was no help either. After a week , Robertson contacted Jackie Greenfield, director of constituent services for Sen. Lisa A. Gladden (41st District) and Del. Samuel I. “Sandy” Rosenberg (41st District). Greenfield said she was told by Scott Leonard, of Amtrak’s Office of Government Affairs, that the escalator is not directly maintained by either the local governments or Amtrak, but rather a privately contracted company. Amtrak spokeswoman Chelsea Kopta initially told The Brew the contractor began working in early May and would be done by the middle of the month. On May 18, Kopta said, “It will be done today.” Subsequently she amended that prediction, saying she had learned about unforeseen repair issues that would mean the work would not be completed until May 25. Today, May 27, three men were working on the escalator, which remains out of service. Asked about the leaking canopy (identified in the 2014 “State of Good Repair Study”), Kopta said a design for roof replacement including the canopy would be completed this summer. Frustrated at this point, Robertson complains about what he sees as a lack of urgency about Baltimore’s train station by government entities. “No one wants to take responsibility and spend their budget,”Robertson said. “A repair like this would not take more than two days” at Washington’s Union Station. In light of the millions of dollars aside for station repairs to the Beaux Arts structure and a recent rate hike for the monthly MARC pass, the poor condition of basic station infrastructure strikes Robertson as baffling. “Fares went up $41 – from $175 to $216 [a month]. We’re paying more, but not seeing improvement. All the while, there’s the platforms and this canopy,” Robertson said. The changes over recent years that he has seen at the station – new signage, planters, metal chairs and tables outside the building near the entrance – strike him as mostly cosmetic.